After finishing my second pint at the Wedge I started my walk back up the hill to downtown Asheville. It was after 7 pm now and the shadows were lengthening, but there was still an hour or two of sunlight left on this gorgeous June evening. Since I had visited all of the places that were on my list, save a few breweries that were located many miles outside of Asheville (Pisgah, Oskar Blues), my next stop was wide open. So I decided to throw all plans out the window and just go with the flow of the evening and see where it would take me. On my way down to Wedge Brewing I walked past a smallish place called Hi-Wire Brewing, so I decided that would be my next stop. I later learned that Hi-Wire is another newcomer to the Asheville Brewing Scene, a member of the class of 2013 like Wicked Weed and Burial. However, unlike those two breweries Hi-Wire beers are bottled and available in either six-packs or bombers. 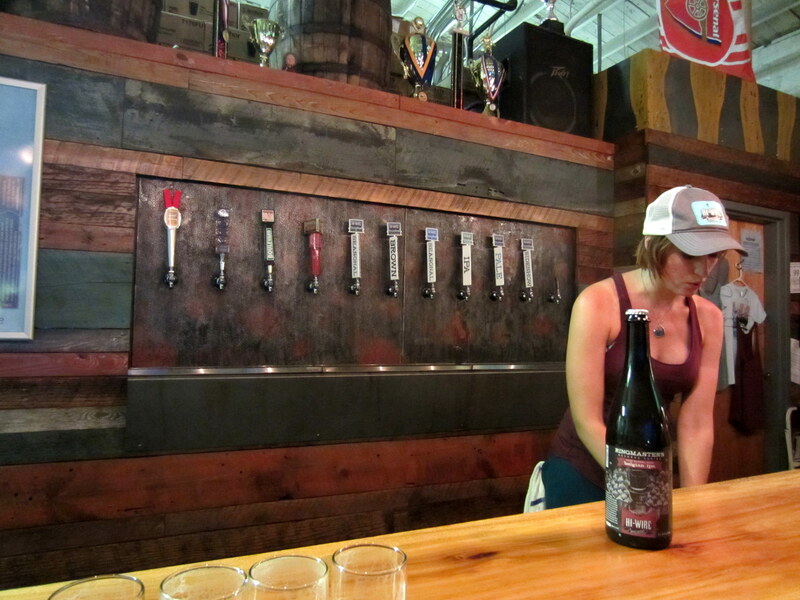 The taproom has a casual atmosphere, and like Green Man there is not a clear separation between taproom and the brewing operations (but unlike Green Man it is completely devoid of green humanoid figures). The evening sunlight was streaming in through the windows and the place had a very cozy vibe. I realized pretty quickly this is a soccer friendly establishment. They were showing the Mexico-Portugal soccer match on the TV (with the volume turned on) and a foosball table occupied a central place in the tasting room. So I’d say this is the place for watching the World Cup if you happen to be in Asheville in the next couple of weeks (Editors note: On their website it says they are open and serving beer for every World Cup match). There was a small crowd, although it was not nearly as busy as the other places I visited on Friday. In fact I was one of the only people sitting at the bar. That gave me the opportunity to have some conversation with the bartender about the area beer scene. She was friendly, knowledgeable, and had a passing resemblance to Jennifer Lawrence. Lest you think that was the fanciful imagination of someone who had just finished a pint of 11% beer, take a look at the picture below and judge for yourself (you’ll have to take my word about the friendly and knowledgeable parts). The tap selection at Hi-Wire. I got a sampler of five beers for $7, probably the best bargain that I came across during my trip. The selection included Prime Time Pale Ale, Bed of Nails Brown, Hi-Pitch IPA, Snakedancer Saison, and a Belgian IPA. They were sold out of their lager, which is something you rarely see. Compared to the beers on offer at some of the other Asheville breweries these beers are more in line with conventional style guidelines, but on the whole I found them to be above average. I thought Bed of Nails Brown and Hi-Pitch IPA were the best in the lineup. They also had 3-4 guest taps on offer (Victory, Boulevard, Rodenbach). As I mentioned earlier Hi-Wire beers are available in bottles and the names and labels of their beers are based on a circus theme. 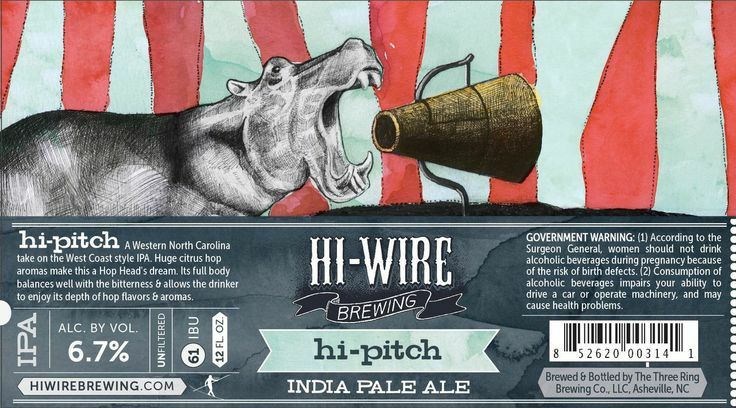 I’ve copied one of their labels from the internet below, but go ahead and Google images of Hi-Wire Brewing to see the inventive labels that go with the other beers in their lineup. Above average beer, fair prices, and a nice atmosphere that reminds you of a casual corner pub. Of the places I visited this seems like the go-to place for watching soccer in Asheville. It will be interesting to see how this young brewery develops. If you go to Asheville it’s worth a stop just for the chance that you’ll be served by the same beguiling bartender that was on duty that early June evening when I happened into the place. That’s it for my special series on the breweries of Asheville. I came away very impressed by not only the beer but also the city. In addition to the great beer you’ll love the food (try breakfast at the Early Girl cafe), the live music, and the outdoor activities. If you are trying to convince your significant other that Asheville would be a good place to visit and good beer is not enough to do the trick there are other attractions. The Biltmore Estate is like an American version of Versailles, Smoky Mountain National Park is only a 1-2 hour drive, and there is a minor league baseball team whose mascot is the Tourists (I was told there are roughly 30 craft beers on tap at the ballpark). If you want to see any of my earlier posts in this series click on the appropriate link below.